They do a fabulous job…efficient, thorough and a pleasure to have in my home! They are wonderful, trustworthy, timely and thorough. I would recommend them time and time again! They did a great job! 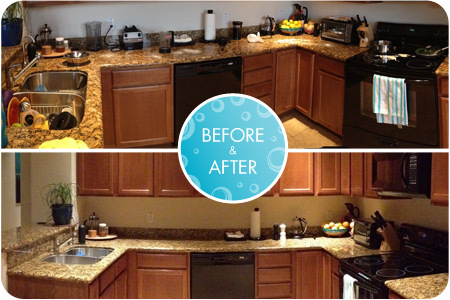 This was a one-time cleaning but I really liked what they did, I am thinking about using them on a recurring basis! We just had our first cleaning with Cleaning Wonders yesterday and I am very impressed with their service and the attention to detail. Everywhere in my house I found little surprises like folded toilet paper and tucked in sheets! I have never been so pleasantly surprised. I also had their window cleaning service and my windows sparkle! Thank you very much for such high-end service and I really look forward to having your company for a very long time! Outstanding, professional service! I hired Ana to help my 72 year old mother get organized & clean her house. Well they went so far out of their way to be helpful, not only did they do a great job cleaning, my mom called and said she had a wonderful time & they laughed all day. Thanks Ana! I am going to get another cleaning for her birthday. Ana was professional and friendly, she gave me a fair price right off the bat. Oma and the crew that came to clean did a nice job. Phone calls were promptly returned and appointments were kept on time. We have hired and fired many house cleaning services through out the years, and I have to say, the two ladies you sent were professional, competent and did an excellent job for me. They did an outstanding job cleaning up after our very messy tile job. 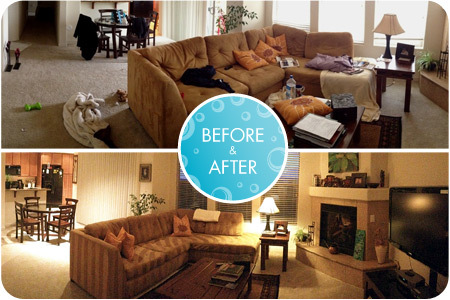 Check out more before & after pictures on Facebook! Click the icons below to view more client testimonials for Cleaning Wonders.